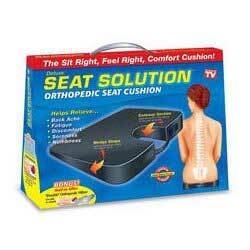 Seat Solution Orthopedic Seat Cushion is designed to relieve nagging backaches, numbness, and discomfort while you sit. It has a special wedge shape with U Cutaway for your tailbone. Includes black dual sided cover, breathable fabric on one side with stain & water resistant finish on the other. The sit right, feel right, comfort cushion! Breathable Fabric Side - Keeps you cool and comfortable. Wedge Shape - Promotes proper sitting position. Furniture-Grade Foam - For support and comfort. Water/Stain Resistant Side - Just wipe clean. Cutaway Section - Relieves pressure on tailbone and spine. Built-In Handle - For portability.